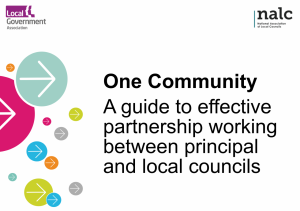 The National Association of Local Councils (NALC) has worked with the Local Government Association (LGA) to launch a new guide setting out how principal and local councils can work more effectively in partnership. This top tip is in the form of bulleted points relating to minutes, and summarises the most common queries and issues we come across when working with member councils. All councils with a turnover of less than £25,000 MUST by law publish on a website draft minutes of all council meetings (including committees) within a month of the meeting taking place, even if still draft. Since our round robin on Friday 11th May 2018 we have had further correspondence from PFK Littlejohn on the issue of the redaction of signatures on published AGAR forms. The issue is due to be discussed further by PFK Littlejohn in the light of GDPR implementation. See below for a copy of the correspondence. LRALC Ltd's Articles of Incorporation can be viewed below. These replace the previous constitution for LRALC. As of Monday 23rd April we have become "LRALC Ltd", with registered company number 11323405. See here for full details. This marks the completion of a 18 month project to become a limited company, though there are still a small number of administrative tasks to complete before the old unincorporated association ceases to exist. NALC is currently undertaking a councillor census survey for parish and town councillors as part of wider work it is undertaking around broadening the demographic of those holding elected office. It is doing this through a specially created Commission.